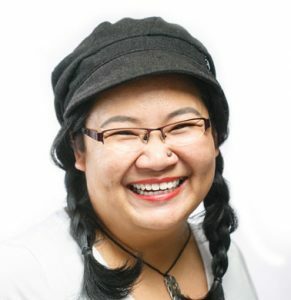 Rainforest World Music Festival is no doubt the most anticipated event in Sarawak every year. I’ve attended a few years of it – one or two as a spectator, and another two as a member of the media. Those were memorable times – the enlightening morning press conferences, the afternoon shoulder-to-shoulder workshops, and the crush of sweaty, boozed-and-stoned humanity in the night, doing their darn best to squeeze official media out of their way so that they can take photos for their blogs on their sleek little cameraphones. The biggest issue with the festival is that the ticket price climbs from year to year. I joined the crowd when it was holding steady at RM60 a night. Last year it was RM80 a night, making the festival something that a local would only go for if they are serious party animals world music enthusiasts and set aside money for this every year, or if they have plenty of spare cash leftover after paying their bills. But money will probably not be such an issue this year. I happened by the RWMF website and found that although there isn’t much information on who’s performing this year, the ticket prices have been released. And they have extremely good news for those of us who can’t afford tickets in the past years. Do you see it? In an unexpected turn of events, the ticket price for adults went from last year’s RM80 to a rock-bottom price of RM45. A 3-day pass is RM100. Suddenly, going to the Rainforest World Music Festival is within the grasp of the common man! 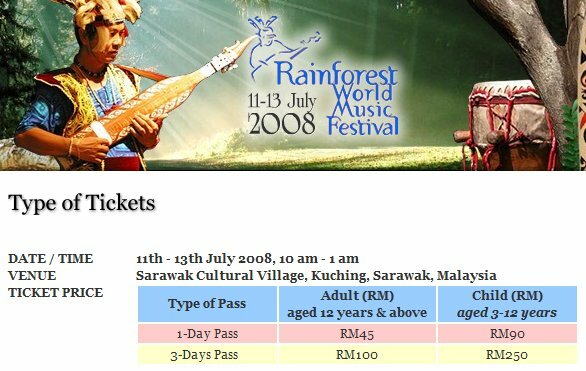 RWMF 2008 is probably worth going to… especially if you’re one of those people who are concerned about getting your money’s worth. I thought that I can only afford one world music festival this year (already booked my plane tickets for Penang‘s), but at RM100, heck, I’d go! One have to wonder why the sudden sleeping on the job change of heart. Could it be because our PM, who has never attended the festival when it was still worth going to not worth paying attention to, announced that he is interested in coming for the subsequent one after RMWF crossed the 10th year hurdle and has to be taken seriously? It really makes you think: Is this their way of saying that they need more adults in the audience? To make you really think about whether or not your TV or computer game-addicted child will appreciate being dragged to a live cultural show? To keep pesky kids and their parents out when such an important guest is present? Or maybe I got it completely wrong. Perhaps this is a way of emphasising how important family values are. I have personally witnessed many immoral acts in the crowd – the drunkenness, chain-smoking, the revealing bikinis and hot pants, the grinding together of lower extremities, the tongue-in-her-ear and hand-slipping-south, etc. Not “family value” at all, although the combination of several elements above have been known to accidentally cause families. Oh sure the PM won’t see any of the drunken revelry because he’ll be sitting on a comfortable dais far from the madding crowd, but who are we kidding. The few thousand others present will either see it or be engaged in it. Impressionable children and their fragile little minds should be kept far away from morally corrupted environments such as this. It makes perfect sense in a country where all the naughty bits are snipped off before the movie hits the cinema. Kids 12 and above are old enough to start learning that such evils exist in this world. Younger kids will have to keep getting their dose of culture from the mold under the bathroom sink until puberty helps them develop a better taste in entertainment. I think the kid (about 6 years old) was embarrassed. See what I mean? We can’t have embarrassed children without the ability to have fun like their drunken parents. Also, cheap tickets for adults mean they have plenty of money left over to buy beer. OH NOES! Now we can’t afford to go!